Ronald and Catherine Berndt shared a distinguished career of almost fifty years, becoming Australia's most respected anthropologists and interpreters of Aboriginal culture. Ronald Berndt was the foundation Professor of Anthropology at the University of Western Australia, a position he held from 1963 to 1981. Catherine Berndt lectured in the same department throughout this period and has since 1984 been an Honorary Research Fellow in Anthropology. 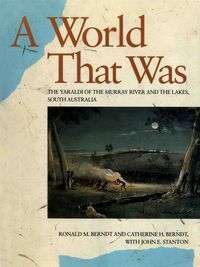 Their many jointly written books include The World of the First Australians (1964), The Aboriginal Australians: the first pioneers (1983), End of an Era (1987) and The Speaking Land: myth and story in Aboriginal Australia (1988).